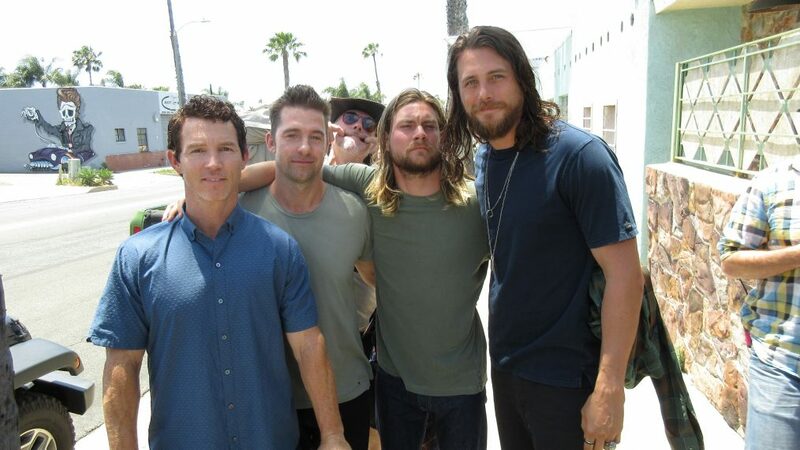 The Cody brothers (Shawn Hatosy, Scott Speedman, Jake Weary and Robson, with camera operator Simon Jayes goofing in the background) are alike in many ways—except appearance. “I think one of the perks of the show’s central story is that we all have different dads!” Robson jokes. Animal Kingdom’s Craig Cody (Ben Robson) has made his share of mistakes—like setting fire to his apartment and stealing his nephew’s girl. In Season 2 of TNT’s hit heist drama, Craig is hoping to finally break away from his crime boss mama, Smurf (Ellen Barkin). “Craig has to prove to himself, and his family, that he can step up,” Robson explains. That may be tough once he and his thieving brothers realize family ties bind for a reason. “They’re so locked in,” Robson says. “Family is their addiction.” Soon, Smurf will take advantage of that fact to draw her boys back under her wing. As we've seen this season, besides Craig, Pope (Shawn Hatosy), Baz (Scott Speedman) and Deran (Jake Weary) are also looking to make their own mark without Smurf. "Every one of the boys has bitched and moaned about how [the business] should be run, what should be done, who should be in charge, how the money should be split, what jobs should be done, how they should be done," Robson says. "All the boys have such big personalities and different points of view, and incredibly stubborn and proud [and] you get to see where the limits of where the boys are prepared to push things to to get what they want, which is really kind of the most exciting part of the season." This being Animal Kingdom, nothing is ever easy and it's been no surprise seeing that being clear of Smurf is both a blessing and a curse. "With the fracturing of the dynamic and from Smurf, Craig really has to prove to himself that he can step up and be the man, Robson says. "Not only does he has to prove that to himself, he finds himself having to prove it to the rest of the family to try and get the respect and to earn the voice that he wants to have in any discussion." All this intense Cody drama, though, gets left behind when the cameras stop. Robson took pics to prove it as you'll see in our gallery.